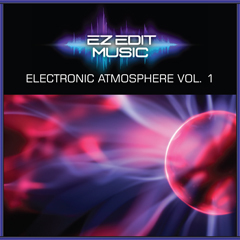 ELECTRONIC ATMOSPHERE VOL. 1 – Welcome to EZ Edit Music ! This collection is comprised of music loops in ambient, fantasy and electronica styles; making them useful for documentaries, technical videos, etc. "Assemblage Point" Stereo-mix plus stems. "Inner Workings" Stereo-mix plus stems. "Silver City" Stereo-mix plus stems. "All That Remains" Stereo-mix plus stems. "Crystals Of Light" Stereo-mix plus stems. "The Ride Home" Stereo-mix plus stems. "Scaling The Tower" Stereo-mix plus stems. "Thoughts Of Tomorrow" Stereo-mix plus stems. "Sea Of Tranquility" Stereo-mix plus stems.